When it comes to choosing the right bed, albeit for ourselves or our dogs, quality is key. After all, beds are big purchases that we hope will last us many years. This means providing year-round comfort and support, without wearing, losing shape or becoming any less inviting. If the bed we sleep on is made of quality materials, this is likely to translate to quality sleep. Likewise, if the bed is chosen with our personal needs and preferences in mind, we are going to feel much more rested come morning. The firmness of the mattress, the thickness of the duvet and the number of pillows we sleep on are all preferences which are unique to us. When we are thinking about dog beds, the same considerations apply. For instance, older, arthritic dogs are going to need greater support from their dog bed, while hairless breeds may need a warmer bed they can nestle into. Big dogs will require more space to spread out, so a flat, rectangular bed would be more beneficial. No two dogs are the same, which is why it is important to base your bed selection on your dog’s age, size, breed and sleeping preference, rather than which looks the most pretty. Bearing in mind the average dog spends 13 hours a day sleeping, investing in a good bed is paramount. Other factors to think about include durability - whether the bed is chew and stain-resistant - and machine washability. A bed that can be washed easily without losing its shape is ideal. What do I need to know about choosing a dog bed? With so many dog beds on the market nowadays, it can be tempting to choose the cheapest bed or the one with the most eye-catching design. As long as it looks comfortable and is big enough to accommodate the dog in question, what else really matters? After all, a bed is just a bed. In actual fact, choosing the right bed will make all the difference to your dog’s continued health and happiness. It is a vital creature comfort, and one we don't recommend you skimp on. That is not to say you should choose the most expensive, but that you should take time to consider your dog's personal needs before purchasing. A bed might just be a bed to you or I, but to your dog, it is their safe haven, their reserved space for rest and relaxation. A bed that is flimsy, flat or the wrong size, material, and temperature won't attract your dog to use it, meaning you needn't have bothered buying it in the first place. Rather than keep opting for middle-of-the-road dog beds that quickly lose their shape, colour and level of comfort, invest in something quality that will endure the test of time. If you live by the 'buy nice or buy twice' motto, you will save time and money in the future. Also, your dog wants a guaranteed place to call home and won't thank you for switching its existing bed for another cheap replacement. Before buying a bed, observe your dog when he sleeps, paying particular notice to his posture and positioning. Some dogs prefer to stretch out, occupying as much space as possible, while others will curl up and nest. If your dog is a stretcher, there is no use buying an oval bed and pushing it up against the wall. You will be much better off buying a rectangular, pillow-style bed that is flat on all sides and spacious enough for dogs that like to spread out. Round or oval dog beds are best for those that like to curl up, nose to tail, or prop their head up on a bolstered side. If you think you already know your dog's sleeping preference - think again. You may keep coming home to find your dog sprawled out on the sofa or floor, despite the fact he usually sleeps curled up in his round dog bed. It could be that your dog is much more comfortable in this adopted position and is merely making do in the bed you have chosen for him. Your dog's comfort and support are the most important factors in buying a bed, so don't overlook obvious signs these need improving. It is also worth considering the material of the dog bed you are going to buy. Dogs are very temperature sensitive, more so than us, and will quickly overheat in an excessively furry dog bed with thick blankets, cushions and all the trimmings. Body hair will be enough to keep most dogs warm, so while it may be tempting to choose a bed that looks cosy and inviting, it is important to keep your dog's breed and coat type in mind. Beds with reversible inners are ideal as the surface materials can be changed according to the situation and climate. Fleece-lining is just what the vet ordered when the weather turns cold and glum, while a cooler, waterproof cushion is more appropriate on wet, muddy days or when the house is noticeably warmer. If you have working dogs, a bed that is well insulated and fully waterproof will prove most valuable as we head into winter. Smaller dogs are more likely to benefit from a fabric, fleece-lined bed they can curl up in and snooze. Having a bed in every room permitted to your dog will ensure it always has a special place to retreat to. Whatever your dog's needs, remember to invest in quality. When buying a dog bed, choose something that combines durability with comfort and support. It may set you back more initially but, in the long-run, you won't be opening your wallet to buy a replacement. Choose something that is plump enough not to flatten out after a fortnight and robust enough not to get torn to shreds by your dog's playing and fidgeting. Choose something that feels as well as looks quality. If the bed can be picked up and dropped and still maintains its shape, you are probably onto a winner. Find out whether the inner cushion is removeable and/or reversible. Is the bed machine washable? Invest in a bed with a quality guarantee and sleep easy that your dog is doing the same. 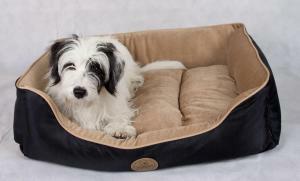 VioVet has just launched a new range of high quality 'VioPet' dog beds, which you can view here. I agree with all the article about dog beds BUT it is almost impossible to get a sturdy, good quality dog-bed into a domestic washing machine, even with the cushion part removed. I have struggled over the years with most of my good quality washable dog-beds to squeeze them through the door and quite often they don`t wash properly because they are jammed in. Not a problem if you live within reasonable distance of a launderette ... they are fewer are further between nowadays and none anywhere near my home. For those who use a flat, pillow style bed with removable cover it`s not a problem, but that is not what my Boxer likes. This does tend to be a problem for some people. For this reason we have designed 'Lola's Lounger' - a great bed for mid to large sized dogs that love to spread out. The bed comprises 7 small, removable cushions that fit easily into a washing machine, no matter how small. The bed needs to be assembled before use but this means it can be washed with ease. I found with my two Leonbergers, they love to sleep stretched out . My solution was to buy 2 memory foam cot mattresses complete with waterproof cover. I then made covers for them from single duvet covers - easy to change and wash - while the waterproof cover keeps the mattress clean and dry.